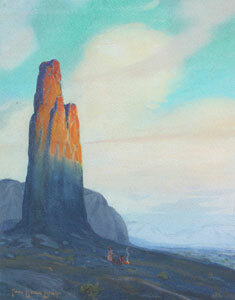 Carl Oscar Borg, Needle Rock, Monument Valley, Gouache on Paper, c. 1920, 15" x 11"
Born and raised in Sweden, Borg emigrated to the United States in 1902 and settled in California. Employed as a scene painter for the movie industry, he had his first exhibition in 1905 and was immediately recognized for his talent. Fellow artists introduced him to the West as a subject and he began traveling and sketching throughout California and the Southwest. His reputation earned him the interest of William Randolph Hearst's mother who sponsored him for five years of study in Europe where he received awards in France in 1913 and 1914. Upon his return to the United States, Borg won the Panama-Pacific International Exposition in 1915. He lived in Santa Barbara from 1914 to 1930 and became a very good friend of Edward Borein's. The two traveled throughout the West painting Indian ceremonials and cowboy genre subjects, teaching art classes as they went. Borg also painted in Central and South America, Spain, Morocco, the Valley of the Nile, and Italy. Carl Oscar Borg, Sacred Rock of Walpi, Graphite on Paper, 8.75" x 10.5"
Carl Oscar Borg, A Sacred Grove, Oil on Canvas, c. 1920, 39" x 52"
Carl Oscar Borg was twenty years old when he left his native Sweden for England. He worked in London as a scenery painter for several years before immigrating to America in 1902. Two years later he moved to California, where he would live for the rest of his life. He was initially employed as a scene painter for the newly established motion picture industry, an experience that surely influenced his outlook on western themes. 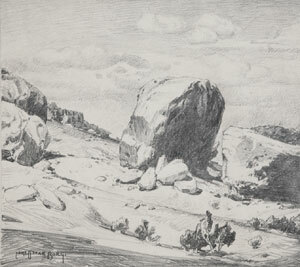 In 1905, he traveled throughout California and the Southwest, sketching and making notes and had his first one-man exhibition as a fine artist. Soon after that, Borg traveled to Paris for futher study, where he advanced rapidly as a painter, gaining notoriety at home as a prizewinner in the Panama-Pacific Exposition in 1915. 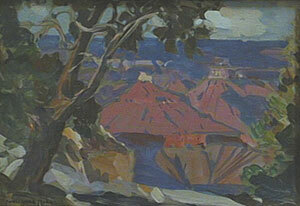 Carl Oscar Borg, Grand Canyon, Oil on Paper, 4" x 6"
By this time, Borg had relocated to Santa Barbara and become close friends with Edward Borein. The two painters shared the same enthusiasm for the West, and Borg developed a local reputation as a teacher of merit. He traveled widely, painting and sketching where he went, and specializing in the scenery and subjects of the Southwest. He also became an able printmaker, publishing an excellent collection in 1936 titled "The Great Southwest: Etchings", which concentrated on Navajo and Hopi themes. Carl Oscar Borg, To My Friend Al Sander, Gouache on Paper, c. 1933, 5" x 6.75"
Carl Oscar Borg was born in Sweden, and apprenticed to the English artist George Johansen at the age of 15. Working as a seaman, Borg jumped ship in San Francisco in 1901. Without funds, he walked the railway, some 450 miles, to Los Angeles, ultimately meeting William Wendt, who would teach him painting techniques. Having shown great promise, Borg was sponsored by Phoebe Hearst to study in Paris, and Rome. It was Mrs. Hearst who encouraged Borg to paint Native American subjects, a theme for which the artist is most remembered. Borg also taught in art schools in Los Angeles and Santa Barbara, where he died in 1947. Known for Southwest Indian portraits in oil, watercolor, etching, or woodblock, Carl Oscar Borg was born in Dais-Grinstad, Sweden. 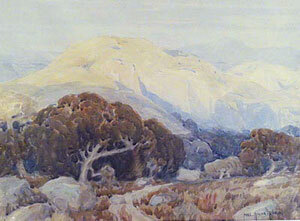 Carl Oscar Borg, Landscape, Watercolor, 14" x 18"
His family was poor, and largely self-taught, he showed early art talent and copied pictures from books as a child. At age 15, he apprenticed to a house painter and at age 20, moved to London and assisted portrait and marine artist George Johansen. In 1901, he arrived in San Francisco from Sweden, having jumped ship as a seaman on the "S.S. Arizonan. " 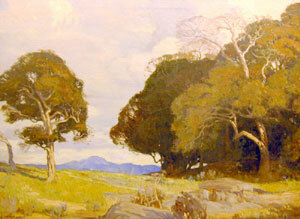 He walked the rail track to Los Angeles, and learned painting techniques from William Wendt, well-known landscape artist. Sponsored by Phoebe Hearst, mother of newspaper tycoon William Randolph Hearst, Borg studied art in Paris and Rome, and she also encouraged him to paint Indian portraits. He then taught at the California Art Institute in Los Angeles, spent six months in Honduras, and from 1918-24, taught at the School of Arts in Santa Barbara. 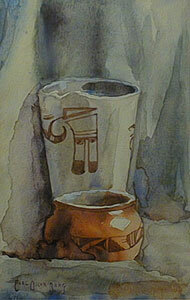 Carl Oscar Borg, Hopi Pottery Still Life, Watercolor, 7" x 4"
From 1924-1935, he was in California and Arizona doing commissioned paintings of Southwest Indian tribal ceremonies for Hearst and also did Grand Canyon landscapes. He traveled in the country when war broke out and was forced to spend World War II in Sweden where his desert and Indian portraits became much sought after. He then returned to Santa Barbara after the War and died there on May 8, 1947. One of his paintings of the Grand Canyon is in the collection of Supreme Court Justice Sandra Day O'Connor, from Arizona. 1. Edan Hughes, "Artists in California, 1786-1940"
2. 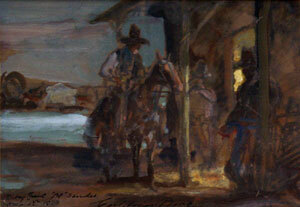 James Ballinger, "Visitors to Arizona"